May be it’s the product line that truly resonated with people or it’s the Dre’s name on the brand, but it’s really hard to imagine how Beats came to be one of the most popular headphone brands in the world. Not all audiophiles may be blown away by the headphones, but Beats definitely made a mark for itself, inspiring a whole generation of entrepreneurs to keep up with their business endeavors. 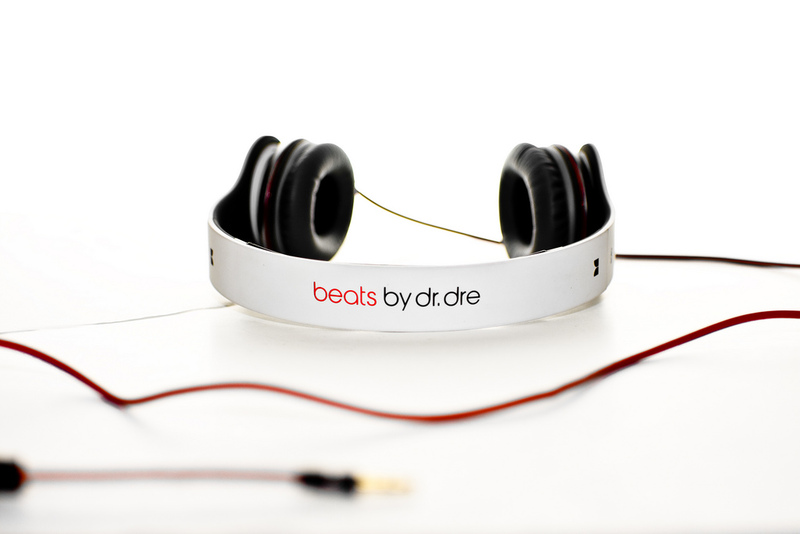 Beats initially faced a lot of criticism because they weren’t designed like regular headphones, and they make the sound more dramatic. This changed over time and Beats become the people’s choice and it single-handedly shook the premium consumer headphone market. A nice pair of headphones is a big deal for audiophiles who like delivery and experience of sounds as they play on tracks. This is the reason why music enthusiasts spend so much money on buying the right pair of headphones. They don’t actually like the music, but they wouldn’t mind better sound. Beats is one of the few brands that is committed to deliver the sound exactly how you’d like it. Beats Solo 2 and Solo 3 are the two great wireless headphones from the house of Beats by Dre which are designed to produce great sound. Although they look pretty same on the outside, there is a little difference between the two Solos. What is Solo 2 Wireless? Beats Solo 2 Wireless is a sleek and sturdy wireless headphone that offers an eye-catching design and a slightly distinct look and comes in its signature Beats style. Not all audiophiles may be blown away by the distinctive design of the Solo 2 as it caters to a specific audience but it’s loaded with tons of features that most music enthusiasts will appreciate. It sounds really well in both the wireless and the wired version. Not only it sounds great but is also very comfortable to wear for an on-the-ear headphone as it is specially crafted for a softer fit for long hours of music listening experience. The best thing it managed to fit in the wireless technology without adding in any extra bulk. What is Solo 3 Wireless? 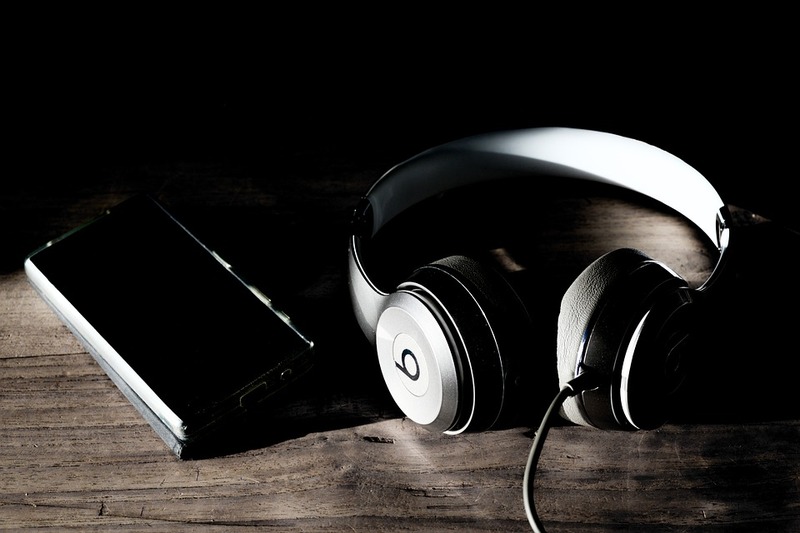 Beats Solo 3 is the new flagship of the Apple-owned Beats with an exceptional 40 hours of battery life and a flawless pairing process afforded by the company’s signature W1 wireless chip for better Bluetooth connectivity. Beats and Apple are changing the way we listen to music with the built-in W1 chip featuring Class 1 Bluetooth connectivity for seamless pairing, keeping your Apple devices a little closer. Plus the new fast charging tech called Fast Fuel is super fast giving you almost 2 hours of music playback in just about 5 minutes of charging. The acoustics are terrible for an exceptional music listening experience but the W1 chip works wonders. – Although both Solo 2 and Solo 3 are a versatile pair of headphones with a sleek and lightweight design and complementing it is the streamlined, flexible headband and cushioned earcups. The Apple.s new flagship, the Solo 3 Wireless, is basically the Solo 2 but with the added luster of the company’s new W1 wireless chip. Both are on-ear headphones with beautifully molded cans, however, the ear pads on the Solo 3 Wireless are not replaceable. Both are mostly plastic and are able to fold down easily making them easy to carry around with ease. – Beats headphones are known for their bass and the quality remains with both the Solo 2 and Solo 3 Wireless. However, the bass has been tamed in the Solo 2 and is now less overpowering than its predecessors. The sound quality is good though but the mids are not as clear as they should be which affects the sound. The bass response in the Solo 3 Wireless is sure to be a crowd-pleaser complementing by a great sound output. It stands up to the Beats’ reputation on delivering rich sound backed by deep, heavy bass, however, it fails to maintain the detailed treble to balance the bassline. – The Solo 3 offers up to 40 hours of battery life, which is a significant upgrade over the Solo 2 which stands for merely 12 hours of wireless action, which is not bad either. The biggest selling point of the Solo 3 is of course, the Apple’s W1 wireless chip which provides seamless connectivity and syncing with other Apple devices, including your Apple Watch. Bluetooth pairing is easy and fun with the Solo 3 and this the area where it excels. Plus the Fast Fuel technology in the Solo 3 makes sure you get up to 2 hours of payback with just 5 minutes of charging. – The Solo 3 Wireless offers some significant upgrades in some areas compared to the Solo 2 Wireless such as fast charging, better sound quality, better connectivity with W1 wireless chip, and so on. However, the additional features come with a hefty price tag which is almost $ 100 more than the Solo 2 Wireless. But the less expensive Solo 2 Wireless will be sure to please faithful users and will meet their needs perfectly without the additional bells and whistles. Both the headphones have their strong points, along with weaknesses. If you’re a music enthusiast looking for a rich sound output, then Solo 3 is your best bet, but it does come with a hefty price tag. The Solo 2 shares the same streamlined, comfortable on-ear design with the same distinctive look. Not all audiophiles may be blown away by the Solo 2, but is sure to please faithful users when catering to a group of Beats headphones fans. It’s a great choice, if you’re not an enthusiastic audiophile. Sagar Khillar. "Difference between Solo 2 and Solo 3 Wireless." DifferenceBetween.net. 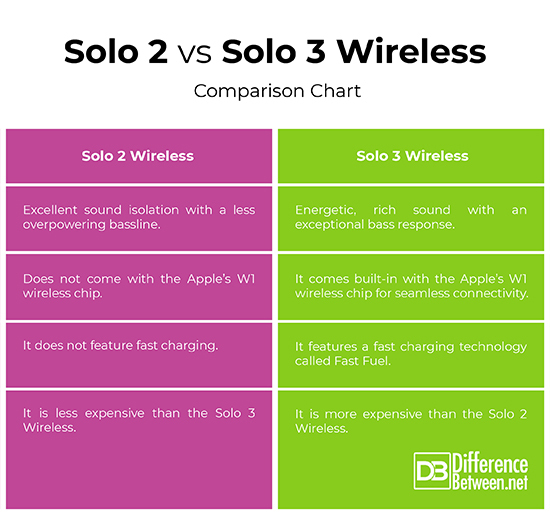 March 8, 2019 < http://www.differencebetween.net/technology/difference-between-solo-2-and-solo-3-wireless/ >.